Niger is Nigeria's much lesser known northern neighbor. To reduce the inevitable confusion, its English pronunciation imitates the French: nee-ZHEHR, and the demonym is Nigerien, with only that second E providing the needed distinction. It's a Sahel nation, meaning it's in the transition zone between the Sahara and the tropical West African coast. Mercy Corps, our fundraising beneficiary, does a lot of work in Niger, including both emergency food relief and helping farmers improve their long-term resilience. 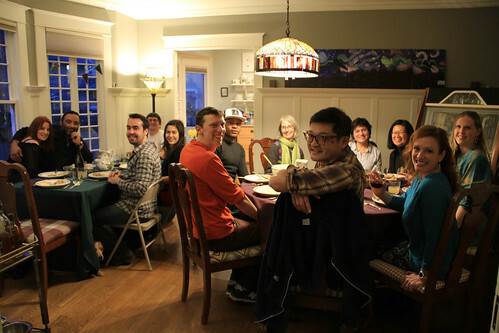 Joining us for the meal were Kal, Douglas, Annette, Eric, Robin, Cara and friends. We were also honored to welcome Issa, a recent refugee from Chad, which has a somewhat similar cuisine, so he very kindly pointed out which dishes worked and didn't. 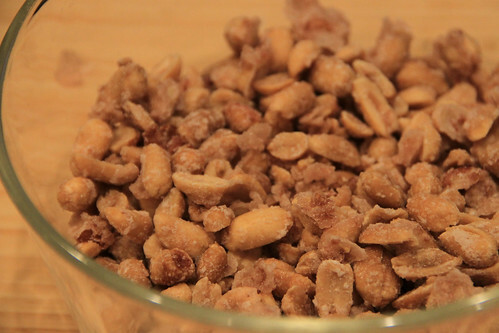 Pour peanuts into a pan, stir in a bunch of sugar and some water, and bake until the water evaporates and you're left with caramelized peanuts. What an easy snack to make! It's a great start to a meal. I can't imagine how tedious it would be to make this dish without an electric blender to grind soaked raw rice into a batter, but I tip my hat in salute to the (most likely) women who've been doing it a long time, because the result is really tasty and satisfying. 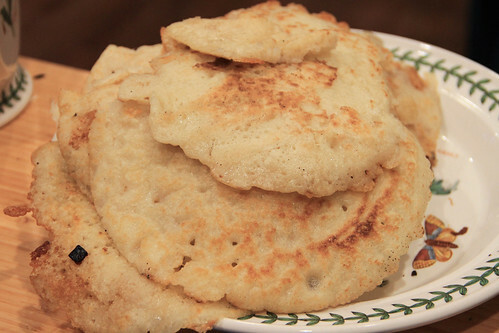 The yeast gives a little tang and volume, and the rice is thick enough that once the outside of the pancake gets crisp from the griddle, the inside is still soft, so it's got a lot of texture and flavor going on. Issa said it reminded him a whole lot of the ones he ate growing up! 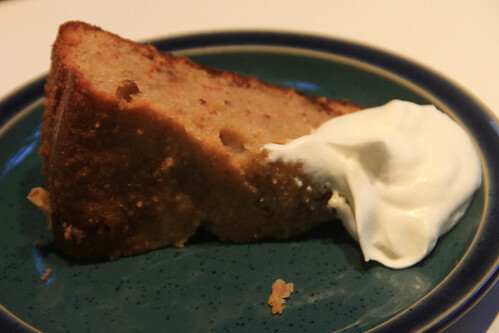 I can't find the recipe I used to make this, but I wouldn't recommend it anyway. While it instructive to make couscous from scratch from millet flour, it took a long time and a lot of work and the result was hardly distinguishable from a decent pre-made couscous. Enough people talk about the wonder of fresh-made couscous that I have to figure it was some failure on my part. And anyway, once mixed with the greens, it was just kinda dry and disappointing. As Issa said, "I'm not really sure what you were trying to do here." 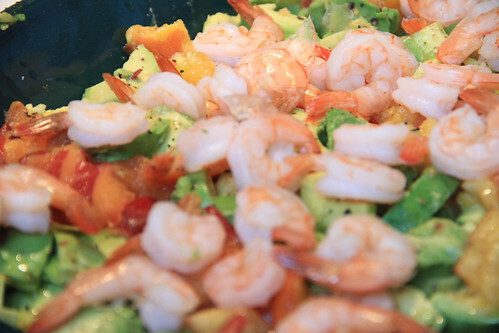 This dish is a great way to fill up, and on its own it's not terribly flavorful. The real star of the show is the peanut-bouillon spice powder in the recipe, which frankly went great on everything in the meal. I cooked just about the same dish for Mali, but it was so good I couldn't help doing it again. I love lamb, I love dates, and I love spices, and it turns out the three of them together with some vegetables to make a rich sauce is a super winner. The only major change from last time is that I left out the steamed bread balls, because there was quite enough starch from the rest of the meal. 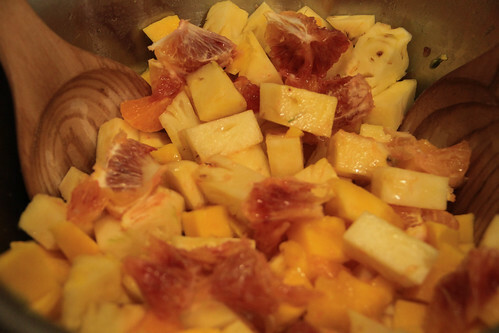 Used what tropical fruits were good at the market: pineapple, blood orange, and mango. For our first ever Nosh in LA, a very Portland thing happened: it started raining while we were barbecuing. It wasn't too hard, and it actually made standing near the glowing coals really pleasant. 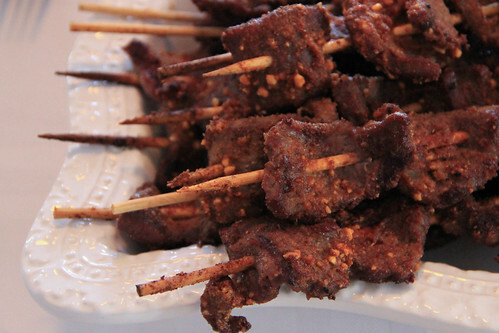 And who knows, maybe that extra bit of moisture helped the beef suya skewers turn out as well as they did. Nigeria is by far Africa's most populous country, ranked #7 in the world at 192 million — with a median age of eighteen and the highest growth rate of the top 15 countries. There's enormous diversity of language, culture and religion, and accordingly there's a lot of variety in the food, though fortunately for the sake of Noshing, there are themes that run throughout most if not all of the food traditions, as well as foods associated with a particular ethnic group that are popular all over. 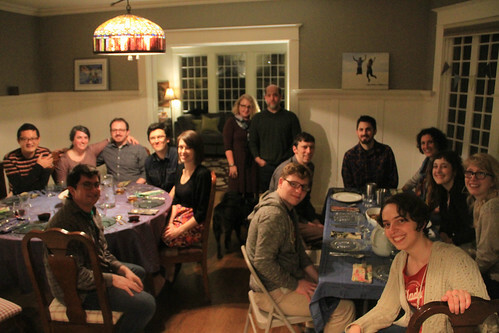 Huge thanks to Kirsten and Alex for not only hosting, but also helping so much with the cooking. 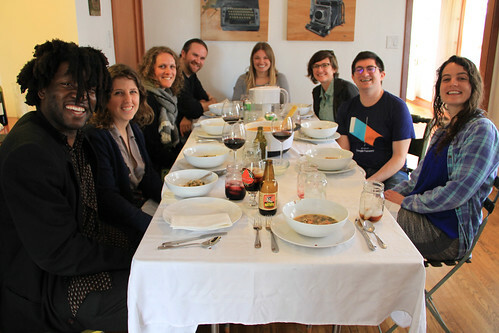 Joining us were Sarah-Doe, Zoe, Jess, Jessie, and our guest of honor Ben, who taught us a lot about the foods he grew up eating with his Nigerian family. Soup is the core unit of most Nigerian meals. The term is applied more broadly than I'm used to; from what I can gather — and please, if you're more familiar with the cuisine, correct me if I'm wrong — any sort of food that's been cooked in liquid until soft will qualify. The two soups I kept coming across were pepper soup and egusi soup. The former isn't a reference to chilis, but rather various spices named for a passing similarity to black pepper. The latter is a melon seed that's ground up and lends thickness, texture, and flavor. Having the time and kitchen space to make only one, I was glad to find that there's at least one group, the Urhobos, who combine them. If you don't have a West African market near you there's no sense in trying to make it, as you almost certainly won't find the core ingredients elsewhere. If you do, well, maybe try finding another recipe. Despite the several steps and promising ingredients, the soup ended up as a confused and underwhelming jumble, both visually and flavor-wise. Or maybe I just messed it up. Either way, maybe better to stick with one soup or the other. 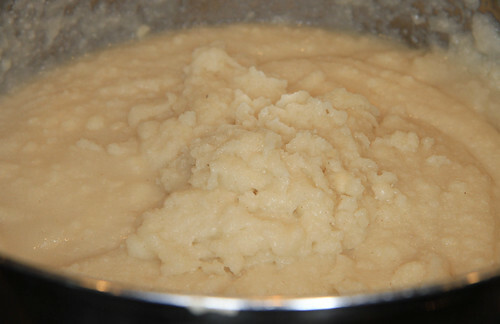 Frequent readers of the blog, all five or so of you, will know that I've struggled with African porridge/mush, and so often ended up with something lumpy and runny. Well, this time I think I nailed it, with something thick enough to roll into balls. 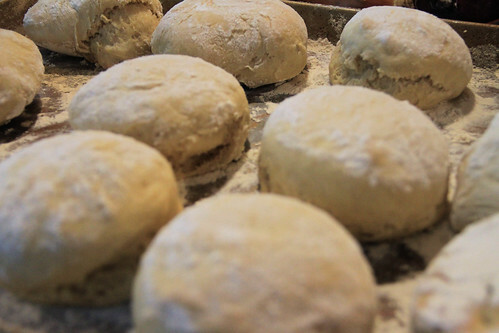 I think it's something about how the prepared cassava flour doesn't require any cooking, so you can keep adding either water or flour as needed until the consistency is right. In Nigeria, a mass of starch like this is called a "swallow." 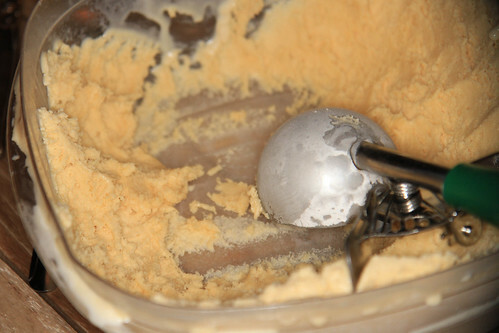 You pinch a piece of it, form it into a scoop, pick up some of the soup or other thing you're eating, and swallow it all. 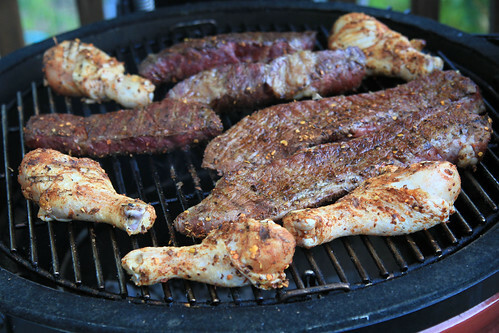 Lots of cultures grill meat on skewers, and some of them season the meat with a dry spice rub. But I've never seen ground peanuts mixed into the spices, the way the Hausas do it. This addition was awesome, adding just a bit of crunchy texture and just barely toning down a moderately fiery rub. A keeper! This dish resembles the more straightforward ingredients and technique that I've encountered in many other African countries' meals. 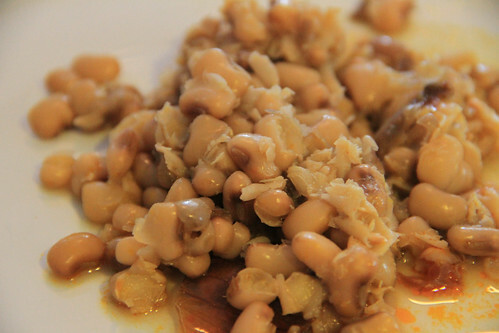 What's notable is the beans, a relative of the black-eyed pea that has a less prominent "eye," is more brown, and has a mildly sweet flavor, hence "honey beans." It was fine, maybe even good if you particularly like the flavor of palm oil. Many Nigerian sweets are fried, but making them would have violated my "no deep frying in other people's kitchens" rule. And fortunately, the market had packages of chin-chin, little semi-sweet fried nuggets. But we had to do something more, and the grill was already hot, so we made the simple yet very satisfying treat of sweet plantains cooked with nothing more than charcoal. There's something exotic about grill marks on fruit, and the end-of-the-coals low heat made for some very nice caramelization. 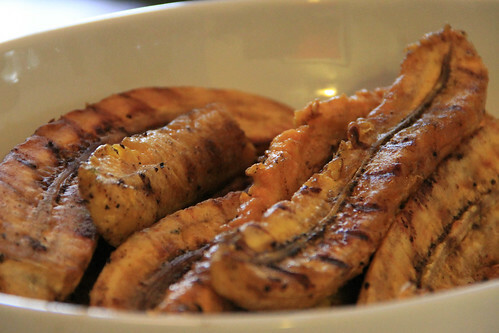 While grilled plantains are most often eaten alongside fish and sauce, in this case they made for a very nice gently sweet finish to the meal. Namibia is a dry place. Most of it is desert, the best-known of which being the Kalahari, with a little strip classified as "semi-arid." In such an environment, few vegetables grow, so for thousands of years people living in this part of the world have relied on animals to turn meager grasses and shrubs into edible food. Accordingly, everyone, including the poor, makes meat a large portion of their diet, so naturally this meal featured meat in several forms. It was hard to find any recipes that were truly Namibian, so I mostly went with South African recipes that seemed most in line with what I could gather is eaten in Namibia. (Perhaps we can blame the fact that the land was administered by South Africa as "South-West Africa" from 1915 through 1990.) Since Laura and I went to South Africa the previous winter, we had a decent frame of reference for the food. While Namibia is a sparsely populated country, our backyard was packed for this meal, since 25 of our neighbors showed up to a block-wide Nosh invite! 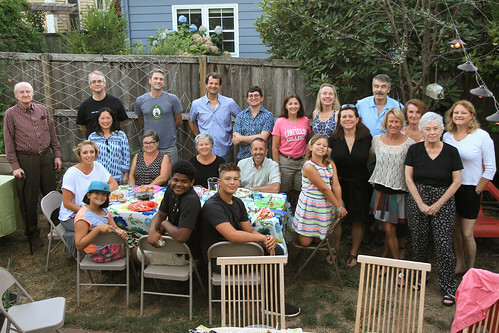 It was a grand time, with old-timers and newcomers alike, and many neighbors who'd never gotten beyond "Hi" finally getting to know each other. We'll surely do it again. 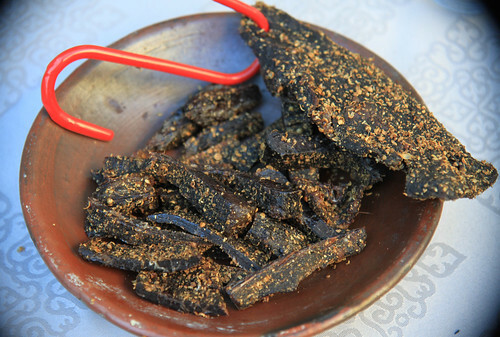 Biltong is like jerky, except with vinegar in place of salt, and deeply intertwined into the culture and soul of a whole region rather than a mere convenience-store snack. While it's better-known globally as being a South African food, many South Africans will tell you that the best biltong comes from Namibian meat. 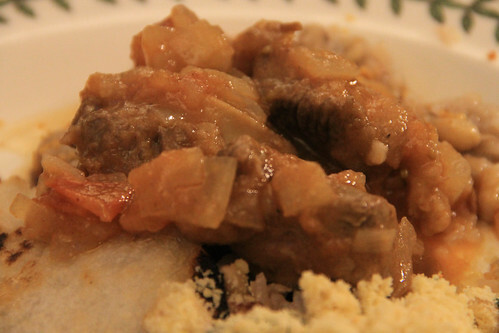 While it can be made from many kinds of animal, particularly game, in this case I used beef. With the right setup and a good butcher, making biltong is really simple. From your butcher, you'll want meat from the back of the hind legs, something low in fat and rather tough, that either you or they slice into fairly thin steaks. All it takes is an overnight marinade in vinegar, coriander, and salt, dry it off, and — here's where the right setup comes in — hang it to cure in a dry, ventilated environment. 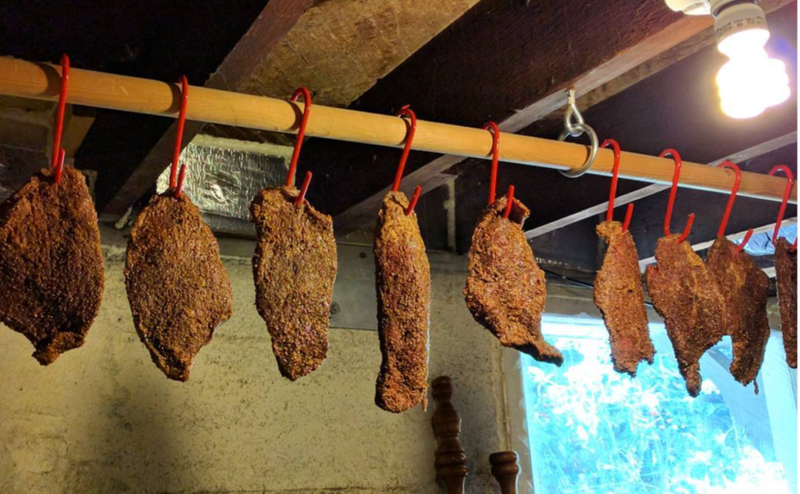 You could use a dehydrator at a low temperature or even use a purpose-built biltong dryer, but I went with the traditional method: hanging in the basement. (Not pictured: a mosquito net I used to keep flies away, and a table lined with paper towel to catch the dripping.) 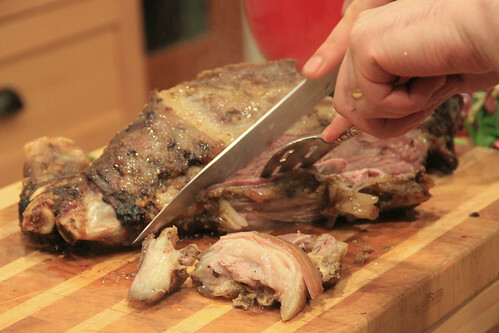 After about a week, the meat had shrunk a fair deal and was quite firm. Against all odds and expectations, it was a huge success. The biltong had a great texture, firm enough to resist but not a chore to chew. And the flavor! Truly beefy, highlighted by the vinegar's tang and the nutty mustiness of the coriander. It's good snacking on its own, and just perfect with a beer. I did a lot of research to see if there was anything specific to a braai that made it substantially different from, say, an American backyard barbecue; as far as I could tell, there isn't, but it was imperative to do one given how important it is to the food culture. I'd brought back a bag of opaquely labeled "Braai Spice" from our trip to South Africa, so I just rubbed that on some pieces of steak and threw it all over the coals. It was delicious. This "little pot food," as it literally translates, reminds me somewhat of the Southwestern chili con carne. It's a meal in a pot that you can cook over an outdoor fire, applying spices from afar — in this case, curry powder — to modest homegrown ingredients. One big difference, though, is that while chili is a true stew, a potjie isn't as liquid. 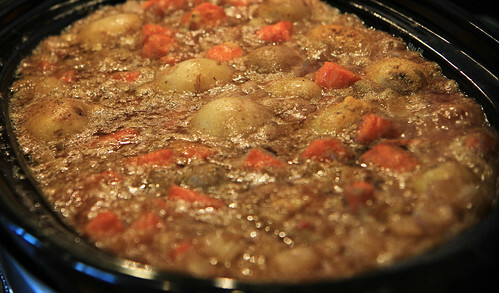 It's also worth noting that it's stirred very infrequently, the idea is that although everything cooks in the same pot, the ingredients retain their individual flavors. A few hours of slow cooking, combined with restrained seasoning, led to dishes that were on the mild, "comfort food" side. Despite how lamb is a more strongly flavored meat, the chicken one had a more developed flavor, perhaps due to the sly "Coke cola" lending sugar and some more spice. Certainly one of the most fun dish names to say! 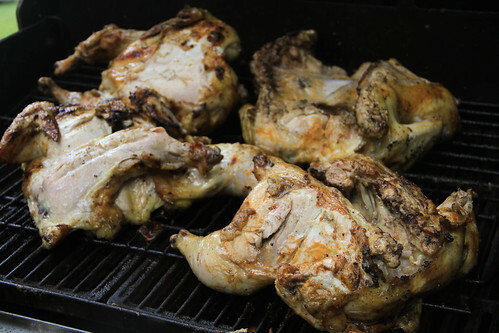 It's also a tangy, (optionally) spicy, warm and stew-y complement to grilled meat. If you're missing one ingredient or want to adjust the proportions, by all means; this is definitely the sort of dish that's more of a throw-it-all-together rather than a strict recipe. 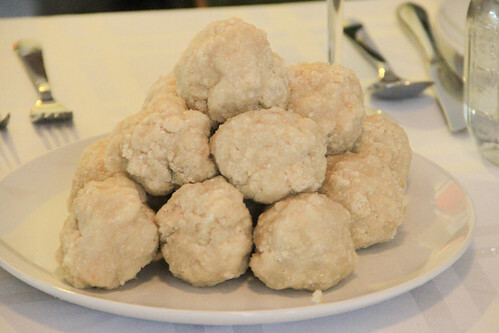 Anyway, pap is like fufu or ugali or any of those other mushes: a bland, dense starch to accompany the meal. After having cooked probably two dozen meals of this kind of food, I think I'm finally grasping that it has to be thick enough to hold, something with no runniness to it. The tough part is that you start with a pot of water and then add the grain to it, so the only way to deal with a too-thin pap is to add more grain. We probably got the texture right, but my goodness we had a lot of leftover pap. Just about the only liqueur from southern Africa that's internationally distributed is Amarula, a sweet, creamy drink made with marula fruit. (You may have seen the video of elephants getting drunk off the fruit; turns out it's a fake using footage from tranquilizations.) It's a bit similar to an Irish cream, but with a subtle tropical-fruit vibe. So I got it in my head to make an ice cream of it, adapting a recipe for Irish cream and simply substituting Amarula (any decent recipe, such as this one, will do). It turned out great: a lovely light brown color, a fantastic texture thanks to the alcohol, and a lovely smooth flavor that's far from overpowering. The perfect conclusion to a summer braai! Writ large, Mauritania is where two larger regions converge in the far west of the African continent. The north is the southwesternmost portion of the Maghreb, bordering Algeria and the disputed Western Sahara which is occupied by Morocco. The south is where the Sahel, the semi-arid strip south of the Sahara but north of the rainforests of West Africa, meets the sea; it borders Mali and Senegal. The population, and thus the food, reflects this division. To generalize over the complexities, it's people of North African descent who speak a dialect of Arabic in the North, and sub-Saharan Africans in the south. There isn't a ton of documentation of Mauritanian cuisine online, so I was lucky to have plenty of help. Marion worked at the American Embassy in Nouakchott, the capital, and introduced me to her friend Sarah who still lives there. Rachel was a Peace Corps volunteer in the south. 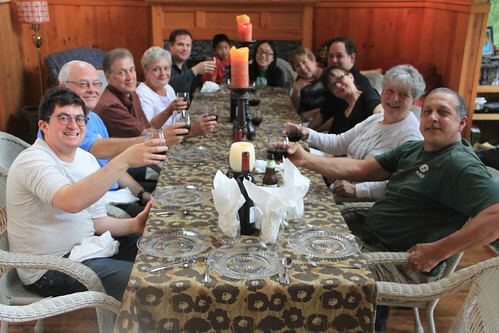 And the Jones family, who lived there for several years, led a very special end-of-meal experience. 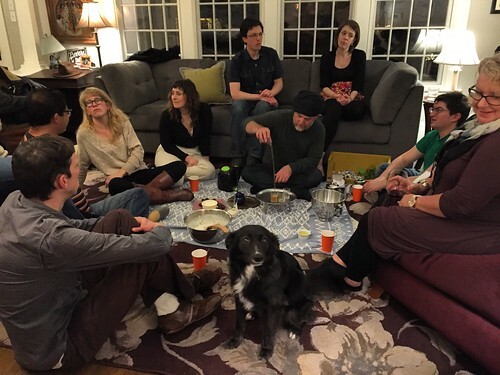 Our guests were Rachel, David, Scott and wife, Eric, Melia, Chelsea, Sarah, Estel, Douglas, and our guests of honor the Joneses, who lived in Mauritania for six years. A week prior, I saw whole frozen goat legs at the Vietnamese supermarket. In a mildly misguided assumption that it would be the appropriate meat, I bought one for this meal, and started defrosted it. Then Sarah told me that when such a roast is done, it's typically lamb; since goats are prized for their milk, they're not as frequently eaten. But in a sort of Plan B for "doing it as they'd do," we agreed that most important is to use what you have. While Mauritanians and neighbors to the north use the same name for roasted meat, "if you want to make it real Mauritanian way then yes keep it very simple, however spices and influence from the maghreb are more and more changing the Mauritanian cuisine." Much as I like cinnamon and cumin and all that good stuff, I restrained myself and followed Sarah's advice to simply use generous doses of butter, olive oil, garlic, salt and pepper, cutting slits in the meat to let the seasoning penetrate. I happened to see goat butter at the store, so I used it, figuring that'd be appropriate. From there, I simply put it in a roasting pan, tented with foil, and baked for a few hours on a relatively low heat. The verdict? Our guests who'd lived in the country proclaimed it better than what they'd eaten there, but missing "the Mauritanian spice": sand. It's got about as many spellings as "baba ghannoush," but call it "cheb" or "thieb" and someone from the region ought to know what it means. 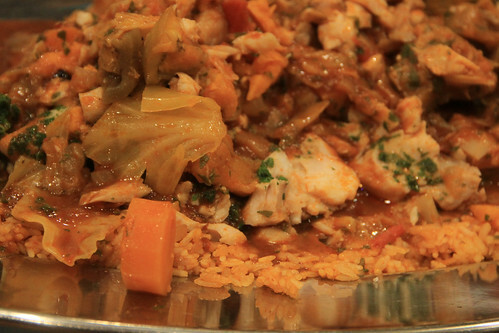 While this rich and complex dish is best known as Senegal's national dish, it's also enjoyed — when scarce resources allow — in the south of Mauritania. My translation of the name glosses over the complexity. There's fish in two forms, both in whole pieces as well as mixed with spices and fried in little balls. There's a flavoring base, plus a bunch of other vegetables with spices. 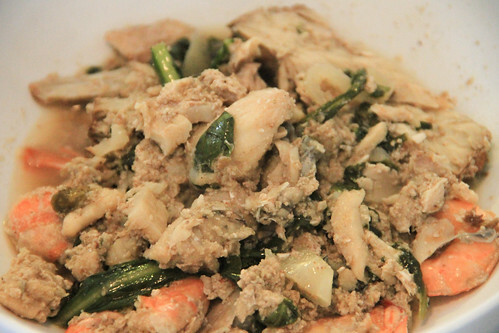 You steam the rice, and then you boil it in the broth in which the vegetables and fish cooked. And then there's tamarind. That's a lot of ingredients and textures! This is the sort of labor-intensive dish you serve for a big group, not just a meal for one or two. Despite getting a few parts of the technique wrong (probably because I only printed up the text and forgot to review the highly instructive photos right before cooking), this was probably the richest dish, with the most complex flavors and textures, I've cooked so far of Africa's many Atlantic-coast countries. From the same region, but on the more humble side of the spectrum, is this basic sauce, similar to many we've cooked from various African countries. According to Rachel, the opportunity to eat this dish doesn't come around all too often for some, who may go days on end subsisting on simply rice and oil. This recipe comes from one of her friends. First, wash the greens. If they are really dirty, do it in the bathtub or another large tub. Several times, til all of the dirt is off. Once washed, grab a handful and ball it up, cut it into thin strips, as thin as possible. Discard stems. 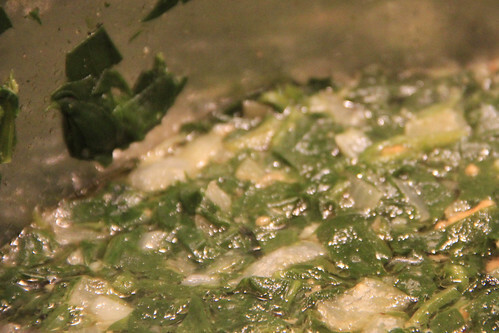 Put shredded greens into boiling lightly salted water for 15 minutes or so. Drain most of the water, leaving a little bit at the bottom. In a pan, heat oil and add diced onion and garlic. 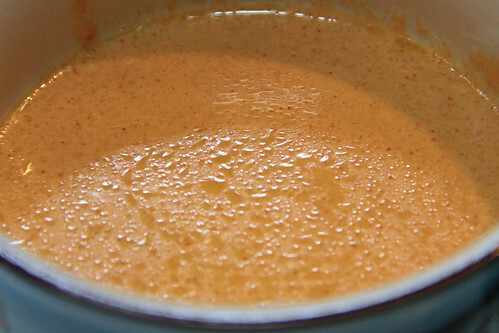 Add chilli – you can use fresh chilli or cheat like me and use sambal olek. Put a bit of the spinach mixture into the pan, return to large pot, all together. Let simmer over very low heat for 20-30 minutes. 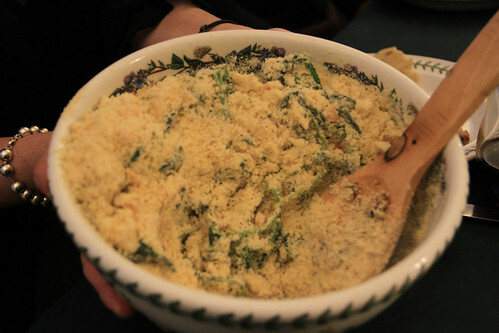 In the meantime, cook the millet (read directions on the package, it’s like making rice). When ready to eat, spoon millet into one large bowl. 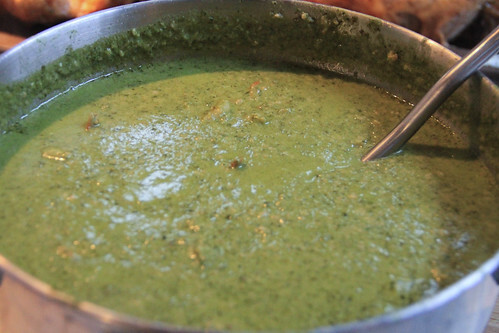 Add the spinach sauce over the top, but only in the middle. Make sure everyone has washed hands and dig in... after it’s had a chance to cool down. Steam the millet until it is soft. Add butter, raisin, vanilla sugar, sugar. Add lait caillé or yogurt, chill and serve. 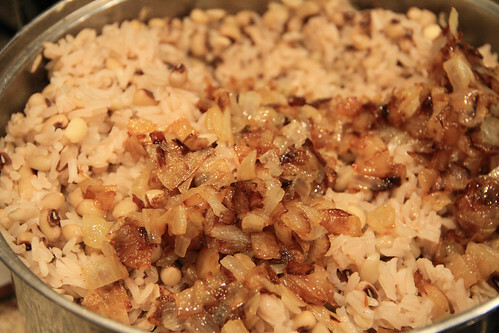 No quantities given because what makes a good thiakry is highly subjective, but fortunately it's easy enough to tweak. The Joneses gave us a real treat: a proper Mauritanian tea service, on the living room rug. My concern that they'd brought four cups for a crowd of sixteen proved unnecessary, as the the tradition is to pass the cups among as many people who are present without concern for, you know, sanitation. (Apparently this extends to public settings too, including the arrivals hall at the airport!) With a crowd, a small teapot, and a ritual that involves rinsing, discarding, and adjusting, it takes a while, but what's the rush? The full treatment involves three little cups: the saying goes that the first one is bitter like life, the second sweet like love, and the third gentle like death. The tea itself is what's known as gunpowder, a Chinese green tea where each leaf is rolled into a little pellet, along with sprigs of fresh mint. For the sweet-as-love glass, it's indeed very sweet. To the extent that your talent allows, pour the tea between glasses to at once dissolve the sugar, cool the drink down, and develop a foamy head. Marion and Sarah advised that a wonderful, and traditional, snack was to dip dates in cream. I had trouble ascertaining the specific type of each, so I erred on the side of delicious, with fresh (not dried) Medjool dates, and crème fraîche. If you dislike either dates or crème fraîche, you won't like this. Otherwise, you'll wonder why don't eat this, like, all the time. A beautifully rich and indulgent dish. I just reread Sarah's email that said to serve this at the start of the email, but goodness, this went well as a dessert with tea at the end of the meal.